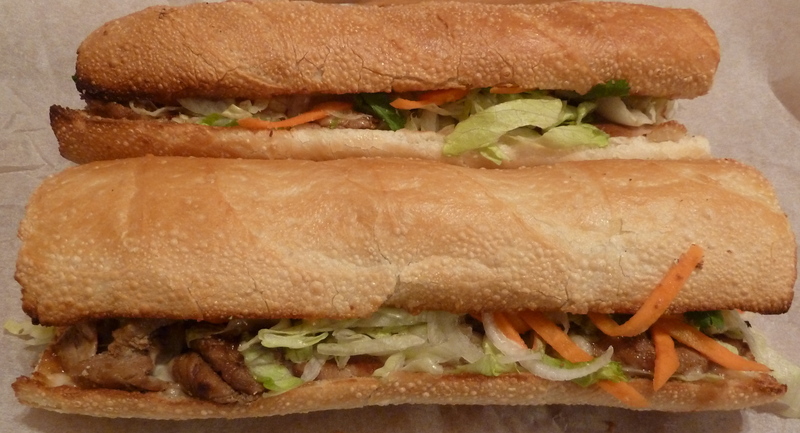 If you work or live in the downtown core, do yourself a favour and try a sandwich from V Sandwiches, a new Vietnamese sub place that opened this past August. This spotlessly clean, tiny little sandwich shop came highly recommended from a co-worker. And when I say tiny, I mean tiny. They have no tables, just a small counter against the window, with four chairs for four small people to sit at comfortably. For big people, you could fit two, but really, it’s more of a place to lean against and thumb through a Metro newspaper while waiting for your order, rather than sitting down to enjoy your meal (although you would be most welcome to do so). Their menu is available online and is also posted in the shop on large flat screen monitor. The menu is colourful, cheerful, and with enough variety to keep a person interested all year long. They have European sandwiches, which are your regular sub-type sandwiches – turkey club, ham and cheese, roast beef and cheese and the ubiquitous BLT. They have their V sandwiches, things like Vietnamese cold cut, pate and cold cut, pork roll, beef roll, and lemongrass tofu subs. Then, they have their Signature sandwiches. It is here on the menu when harps begin to play, angels come out to hand you a tissue to dab the drool from the corner of your mouth, and the rest of the world goes away. These subs are prefaced with the words, “For some serious nom nom”, and they aren’t kidding. For our supper tonight, I selected the grilled pork, and the sate chicken subs. I pre-ordered, and they were just finishing them up with I arrived a few minutes earlier than planned. The cost for both was just under $15.00. Sitting on the bus with growling tummy, and smelling the sate chicken was almost too much to bear, but I managed to hold off until I got home. We unpackaged our sandwiches, cut them both in half, and dug in. We started with the grilled pork. The ingredients were fresh, the pork amazing, and seriously, I have no words to describe it. Yummy. How’s that? The combination of flavours hit the spot. I am usually a bit nervous ordering to spec, too much sauce, too many onions, but my nerves were unfounded. The balance was absolutely perfect. The grilled pork didn’t last long, and soon enough we were into the sate chicken. Again, the balance of heat and spice from the sate, the crisp fresh veggies, the tang of the pickled carrots, and the background flavour of cilantro was perfect. Not one flavour dominated, yet each distinct, and melded together in perfect harmony. V’s is becoming popular with the downtown lunch crowd, and telephone pre-orders would be recommended for those with a short lunch break. I was there shortly after 5:30 p.m. to pick up a pre-order and didn’t have to wait at all. The shop closes at 6 o’clock, so make sure you act on your craving early in the day. I fully intend to return to V’s and work through the menu over the coming months. I wish the owners and staff of V’s every success and good fortune with their little shop, and thank them for bringing us great tasting, fresh, food in the downtown core. Previous Post Raisin Pie for Afternoon Tea! Tammy is such a sweetheart and the sandwiches divine ! Anything that has the letter V in it is of interest to me ! Haven’t heard of it,but my eyes and ears are to the ground and hope I see it when I pass by!